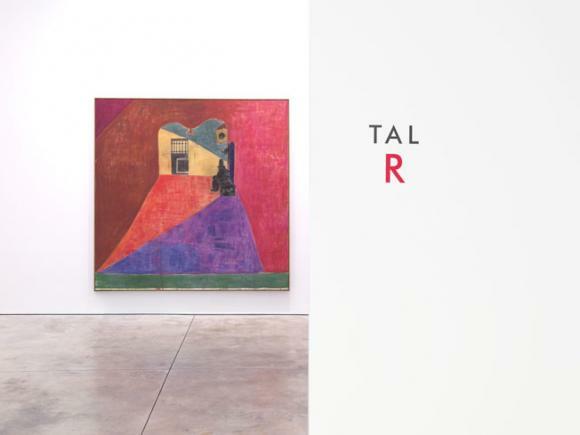 Cheim & Read is pleased to announce an exhibition of recent paintings by Tal R. This is his first exhibition with the gallery. The show will be accompanied by a full-color catalogue with an essay by Matthew Israel. Tal R was born Tal Rosenzweig in Tel Aviv in 1967 to a Danish mother and Czechoslovakian Jewish father. Raised in Denmark, his childhood was defined by his family’s split identity: the orderly Scandinavian society of his maternal side contrasted with his father’s experience as a Holocaust survivor. Tal’s traditional Hebrew name, which also means “number” in Danish, did not assist in his acclimation, especially among school-aged peers. Drawing provided a needed escape. As he has said: “For me, drawing was the same as dreaming at night: you don’t decide what to dream about, you dream about what you need.” Tal’s self-identification as an outsider, caught between two worlds, fueled a fertile artistic landscape of shifting realities. His unique vision eventually led him to the Royal Danish Academy of Fine Arts, where his work caught the eye of Louisiana Museum curator Anders Kold. The duality of Tal’s heritage is recognized in his work, which offers sensations both celebratory and sinister. Saturated color is weighted by shadow; café and street scenes, festooned and radiant, are simultaneously claustrophobic and labyrinthine. His subject matter is intentionally easy to describe, but meaning, as in dreams, is enigmatic. Tal works with a variety of media—collage, sculpture, installation, painting—and intuitively culls imagery from diverse sources. (He cites the Yiddish word kolbojnik—“leftovers”—as a loose definition for his process of gathering inspiration.) Historical and art historical references abound: threads of Expressionism, Fauvism, and Symbolism run throughout, as do nods to traditional Scandinavian art, Art Nouveau, and outsider or children’s art. For this exhibition at Cheim & Read, Tal presents a group of carnivalesque-like canvases, patterned with psychedelic stripes and sometimes inhabited by a character named Shlomo (short for Solomon, Shlomo is also Tal’s middle name). Shlomo is both formalist prop and narrative force; his presence lends a sense of ennui to otherwise vivid compositions. Kandinsky-like color vibrates in paintings like Night Awning, 2012, and Klee-like patterning creates the patchwork construction of House Bonni, 2012. Girl Sitting Next to Marie, 2012, references the art historical canon of café imagery, but is bordered by darkening shadows. Amusement park scenes – The Swan and The Swans, both 2012, glow unnaturally and are turned on their sides, as if stolen from a child’s imagination. Tal achieves his translucent color by mixing pigment with rabbit skin glue. Fast drying, the medium does not accommodate multiple layers or revisions—paint is applied quickly and confidently, resulting in canvases which emphasize surface even while presenting scenes of mysterious depth. The viewer, at first bombarded with color and texture and then becoming cognizant of narrative structure, is left to navigate splendid but distorted passageways, as if entering an unhinged dream. Tal’s work reveals the effect of an image on the psyche—the viewer’s own unconscious is an active participant in the scene.